Saint Pascal Baylon was a 1500’s Spanish friar and the patron saint of the Eucharist. Pascal (Pacual in Spanish) was born on the Feast of Pentecost, hence the name Pascal, a variation of the Spanish word for Pentecost. (The Pentecost is when, after being crucified, Jesus returns to give the Apostles the Holy Spirit to guide them on Earth.) Baylon is derived from the Spanish word for dancing. As a friar, Pascal was responsible for the monastery’s kitchen and orchard. Stories abound of angels helping with fruit harvest as Pascal was busy thinking about the Eucharist. 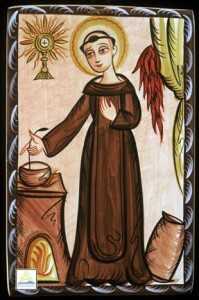 Legend states Pascal, while serving in Mexico, invented mole in order to stretch the meal he prepared when visiting friars unexpectedly arrived. 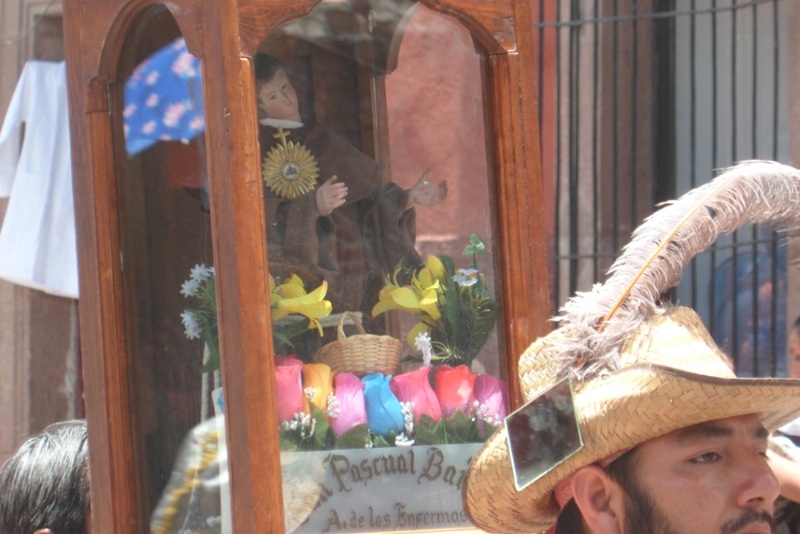 Like with Saint Isidore, Pascal was of grand importance in early San Miguel as both saints’ feast days occurred what was then, the end of the rainy season (May 15th and 17th). Special dances honoring green vegetables are still performed at the Temple of the Third Order (next to San Franciso). Dances feature a tiny flute while male dancers have rakes and other instruments of working in the field. Women raise up a basket of fruit symbolizing how women raise up their spouses. Also the orchards around town were blessed prior to harvesting the now ripe fruit. Orchards were once plentiful in San Miguel including the areas that today are known as Parque Juarez, del Obraje, San Juan de Dios and La Aldea. All areas then populated by the indigenous population while centro was reserved for the Spanish. Art featuring San Pascal is plentiful in San Miguel, especially in kitchens, as he is often depicted in a kitchen before a vision of the Eucharist.